Toronto’s Images Festival celebrated their 26th year back on April 11-20 and handed out several awards to experimental media makers and installation artists. 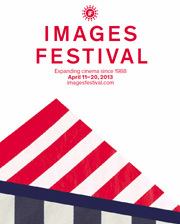 The grand prize of the fest is called the Images Prize and recognizes the Best Canadian Media Artwork. This year the Images Prize went to Adele Horne‘s meditation on home cleaning, Maintenance, which you can now watch online. Other media work winners include animator Jodie Mack taking home the Marian McMahon Award for her auto/biographical rock opera Dusty Stacks of Mom; Dan Browne won the Deluxe Cinematic Vision Award for his multitudinous image collage memento mori; and Jane Gillooly won the On Screen Award for Suitcase of Love and Shame. Artists who won for their installation work include the OCADU Off Screen Award going to Andrea Geyer’s Sound Giving Will Feeling (an insistent entity reached) and the Overkill Award going to Kuai Shen’s 0h!m1gas: biomimetic stridulation environment. The full list of winners is below. You can also check out the full Images Festival lineup on the Underground Film Journal.